Snowmageddon is here! So for those of you who will be spending the month shoveling snow (hopefully while getting in some playtime with your pets) or (like us) driving up North to have a day of fun, the Ruffwear jackets are the ones you want! Before you head out, remember that it’s important to prepare you and your pets. We just received a few of the newest items offered by Ruffwear, one of our most favorite places for durable, incredibly designed coats and beds for pets. Not all dogs need coats and you risk overheating if you make them wear one and they don’t need it. This will depend on your pet’s coat, their natural tolerance, and their experience. Some dogs (like the double-coated Malamutes or Samoyeds) thrive in colder weather. 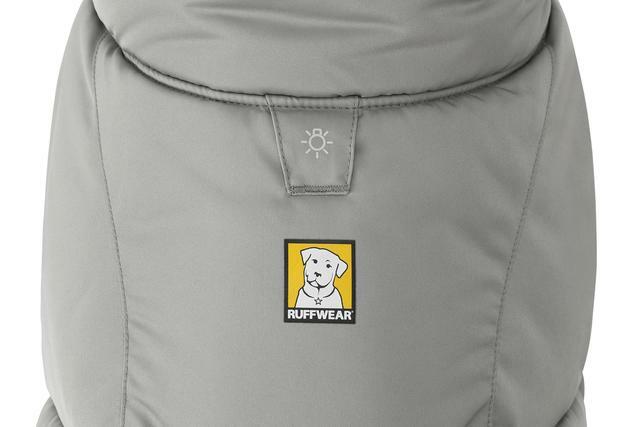 For them, you may just want to make sure you have a comfortable, easily washable blanket – which brings us to the newest blanket from Ruffwear! 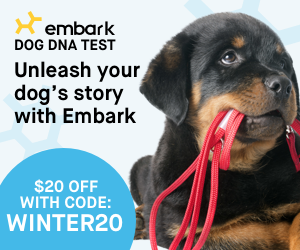 Our dogs are native Arizonans, so they are not accustomed to cold weather. They have very short coats and much prefer to be outdoors in 120 heat than -20 cold. When we head up North for a play day, we have to take a lot of precautions. The Clear Lake Blanket is the ultimate road trip blanket. It’s much larger than I thought it would be, especially since it easily fits into a small stuff sack. It’s the perfect blanket to keep at home and in the car for that extra feeling of security everyone loves. 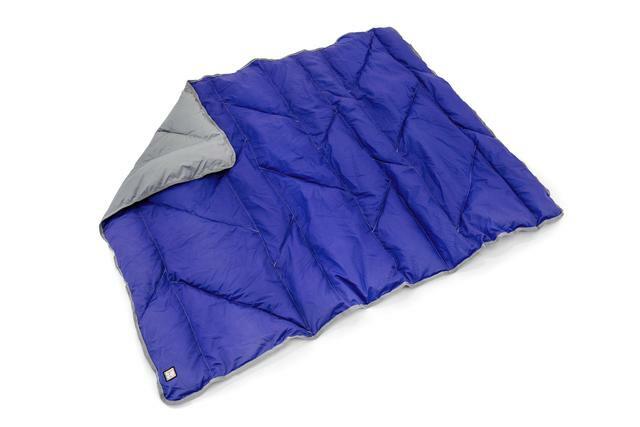 This blanket has a 75D water-resistant AND abrasion-resistant shell and features 500g polyester insulation for extra warmth (bluesign®-approved). The nylon shell makes it very easy to remove the inevitable dog hair that seems to get everywhere by simply shaking it out. Washing is simple – just toss in the washer with a mild detergent and tumble-dry low or let it dry in the sun. The blanket is available in one GIANT size (43” x 55” which is nearly big enough for you AND your dog to stretch out) and compresses into a very small 14.5” x 7” stuff sack. 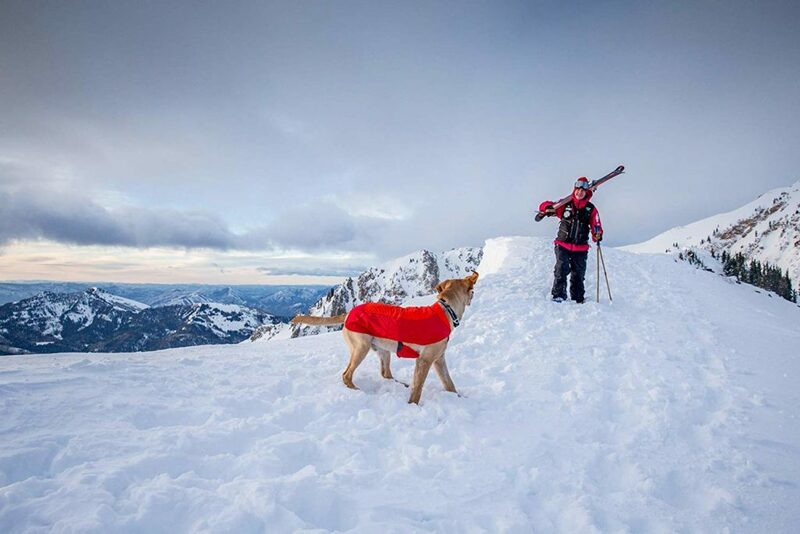 If you’re heading up to the mountains for some cross-country skiing, and have a short coated dog, consider the Vert™ Jacket from Ruffwear. The Vert™ Jacket is a new offering from Ruffwear! 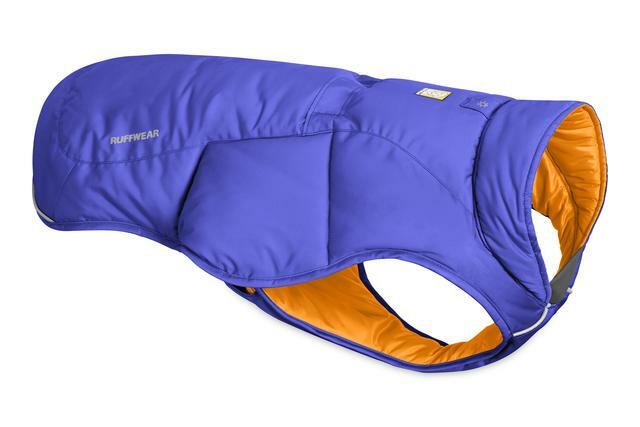 This is a windproof, waterproof, breathable dog coat that is perfect for winter conditions. 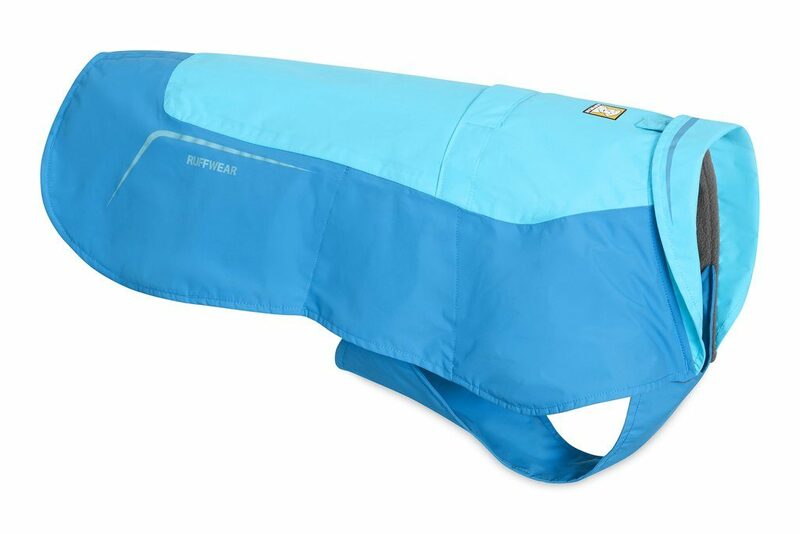 The Vert features a super-soft fleece lining to keep your dogs toasty warm and protect from the elements. 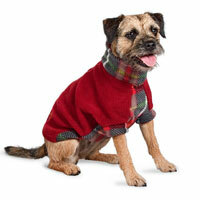 This jacket is the perfect cold-weather coat for dogs who need a little help in frigid regions. Leg loops are built into it, which help keep the coat in place when walking (or during high winds). This is especially valuable during those cold winter afternoons when the wind reaches its peak. This new design is ideal for dogs like Brock, who have big chests and don’t get as great of a fit with the coats that cover the shoulders. 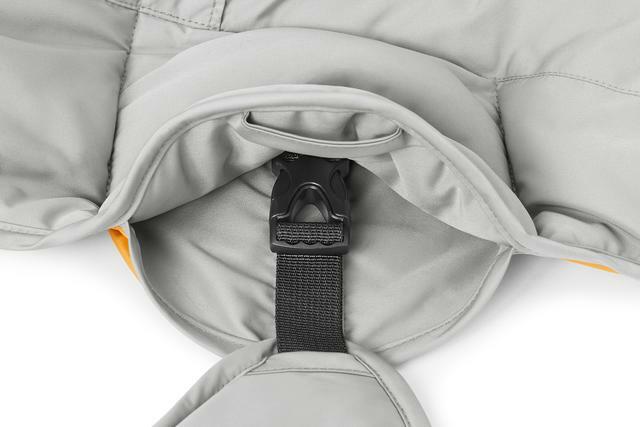 As with all of their coats, this one features an easy-to-use harness loop that is perfect for harness use underneath. We love this design because it let’s us keep our pets secure in their harnesses even while wearing a coat! This coat features an oversized storm collar that you can fold up around the neck for even more protection from the battering wind. 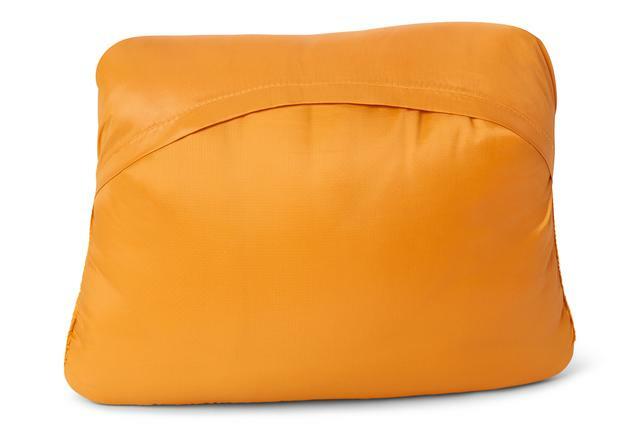 The shell is made up from 70D nylon, which is both windproof and waterproof, but still breathable. The lining of the coat is also pretty incredible. The extra warmth can be partially attributed to the comfortable, soft fleece (featuring anti-pilling coating and DWR finish). 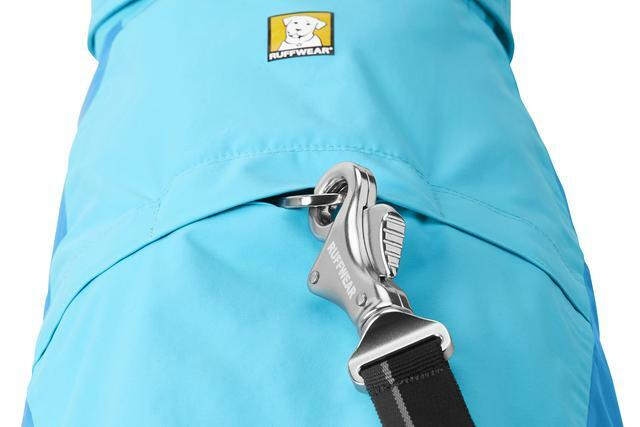 As with all of the other dog jackets and coats that Ruffwear offers, the Vert features side release buckles for easily putting the coat on or taking it off. Best of all, the interior buckle helps prevent snow from freezing around the buckles! This coat is available in Blue Atoll or Sockeye Red and as with most of their coats, feature reflective accents for low-light visibility. The Quinzee jacket is not only ideal for cold mountain air, it gives plenty of flexibility for play. 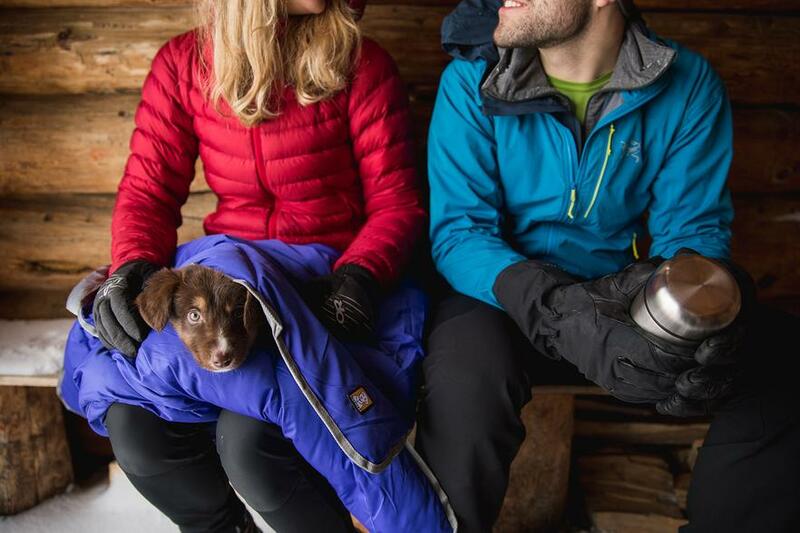 This insulated jacket is ideal for a day hike in the cool country, sledding, skiing or when you’re on the road and just need something when you stop. 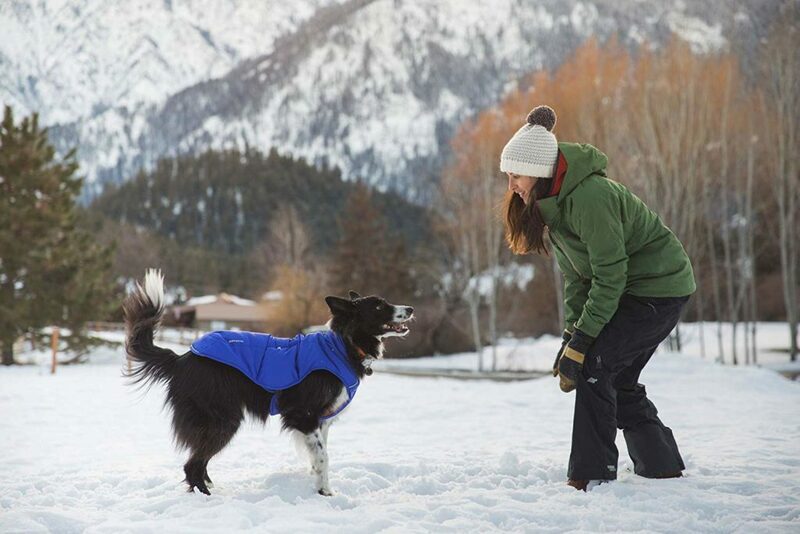 The 75D polyester shell isn’t totally waterproof, but it will keep the wind off your pet’s back and the snow from sticking to their fur. If you live in a very dry region with a lot of static electricity <ahem, Arizona>, this coat is perfect because it doesn’t “shock” the dog when they come indoors. We love these fabrics! Recycled 250g high loft polyester insulation provides a bit of warmth, but not enough to overwhelm a large, double-coated dog (or a dog who just runs hot). 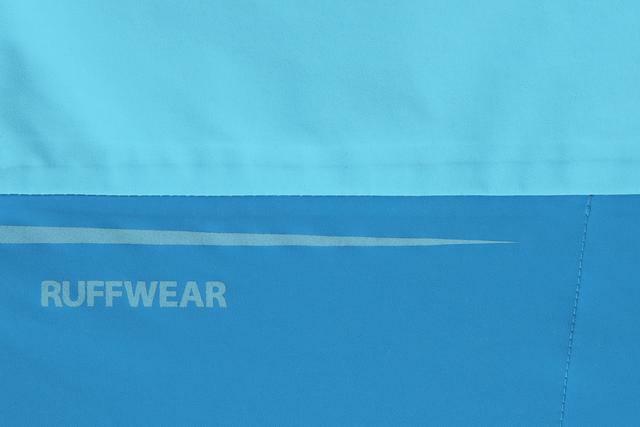 It’s not a full body coat, although it does wrap around the body nicely for a secure fit. If your dog doesn’t like the “legged” coats, this is ideal! This coat also features Ruffwear’s patented buckle system and as with most of their coats, features reflective accents to make your pets easy to find at night or in the white snow. 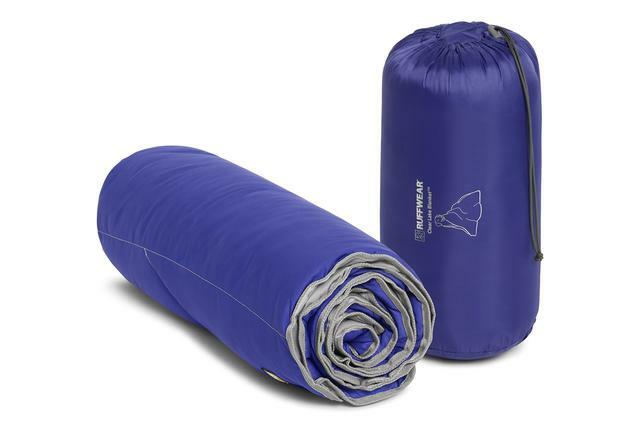 On top of that, it has a built in shell/stuff sack that allows you to bunch the coat up into a ball and keep it that way for easy packing. This is the coat that we keep handy throughout winter! The Quinzee packed away into it’s built-in pouch. There’s a lot of great things to love about Ruffwear, so if you haven’t seen their new products, be sure to check them out. We know you and your pets will love them as much as we do!